Hollygram Big Blue Bear or Gucci as we call him is our blue mitted boy. He is 8 years old and is a big softie. He has stunning blue eyes and has sired many beautiful kittens who have all proved to be sturdy and good sized. He is a very lovable cat and thrives on attention from everyone. 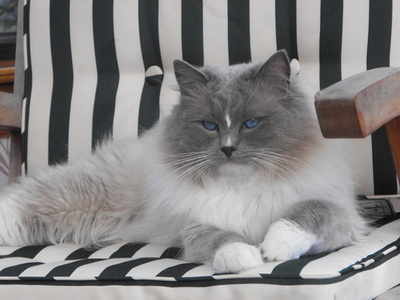 Gucci has the perfect ragdoll nature and is very affectionate with the other cats. Sanjo is our newest addition to the boys. He is a chocolate colourpoint and is almost 3 years old. All his lines trace back to the original traditional ragdolls. We are hoping to begin breeding chocolate and lilac colours in the future.